Overseer Network Monitor uses standard Windows network APIs to monitor the event logs on any of your Windows-based servers or workstations. 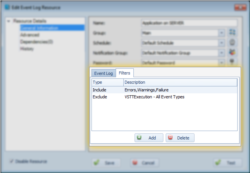 Monitoring Windows Event Logs are critical to knowing about problems as soon as possible, because most software, including Windows itself, logs critical problems to the System event log. Overseer Network Monitor 5.0 is able to monitor the new event logs present in Windows 2008 R2, the 'Applications and Services Logs' section. Not all event log monitoring software is capable of monitoring this type, as it uses a new API. Overseer event log monitoring can also filter our duplicate events to keep you from receiving multiple notifications over the same issue when something goes wrong. 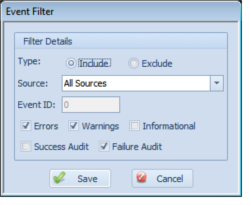 Filtering can be done based on the type of the event, or the type of the event and the specific data included in the event. Overseer can monitor event logs on remote computers, without any agent installed on the remote machine. This saves you a lot of time and effort in setting up your monitoring system. 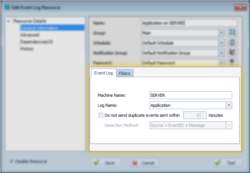 Overseer can monitor the new event logs present on Windows 2008 R2 machines, termed the 'Applications and Services Logs'. These logs often contain more specific information, and will likely become more used in future version of Windows. Overseer can detect duplicate event log entries, and suppress sending them. This is useful to prevent floods of errors to your EMail or cell phone when something goes wrong. Duplicate detection can be done by message type, or type+message data. Overseer can filter the event log so you only see the events you'd like. You can either filter out everything except specific events, or include everything but exclude certain events. You can define the level of events you'd like to include/exclude, such as Errors, Warnings, Informational, Successes, or Failures.